In the latest edition of the Times Higher Education (THE) World University Ranking, LMU retains its position in 29th place in the overall table, and once more tops the list of German universities. 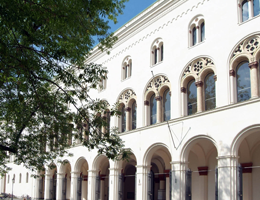 “This result once again documents the consistently high level of research and teaching at LMU and confirms its status as the leading university in Germany,” says Professor Bernd Huber, the President of LMU. The top three places in the latest THE University Rankings go to California Institute of Technology, the University of Oxford and Stanford University. The Times Higher Education (THE) World University Ranking first appeared in its present form in 2010. The ratings relate to 800 preselected universities located all over the globe. According to Times Higher Education, the methodology used is characterized by a high degree of quality and transparency. The emphasis is placed primarily on the level of performance in the core activities of all universities - research, tuition and knowledge transfer – rather than on factors like public reputation or tradition. The Rankings are based on 13 indicators, with the greatest weight being assigned to the number of citations of scholarly publications, the overall quality of research and the quality of teaching, each of which contributes 30% to the final score. Since 2015, the citation data used in the THE Rankings have been provided by Elsevier (Scopus).